Cicuta maculata.Max Licher.Southwest Environmental Information Network.SEINet.swbiodiversity.org (Accessed 5/2014). 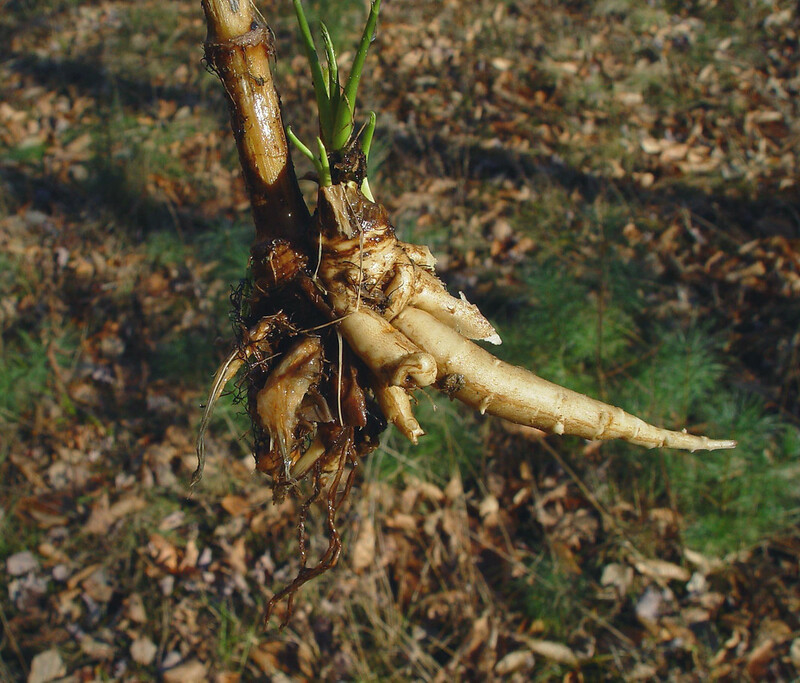 Cicuta maculata storage roots. By Arthur Haines. Copyright © 2018. New England Wild Flower Society. gobotany.newenglandwild.org (Accessed 1/2018). 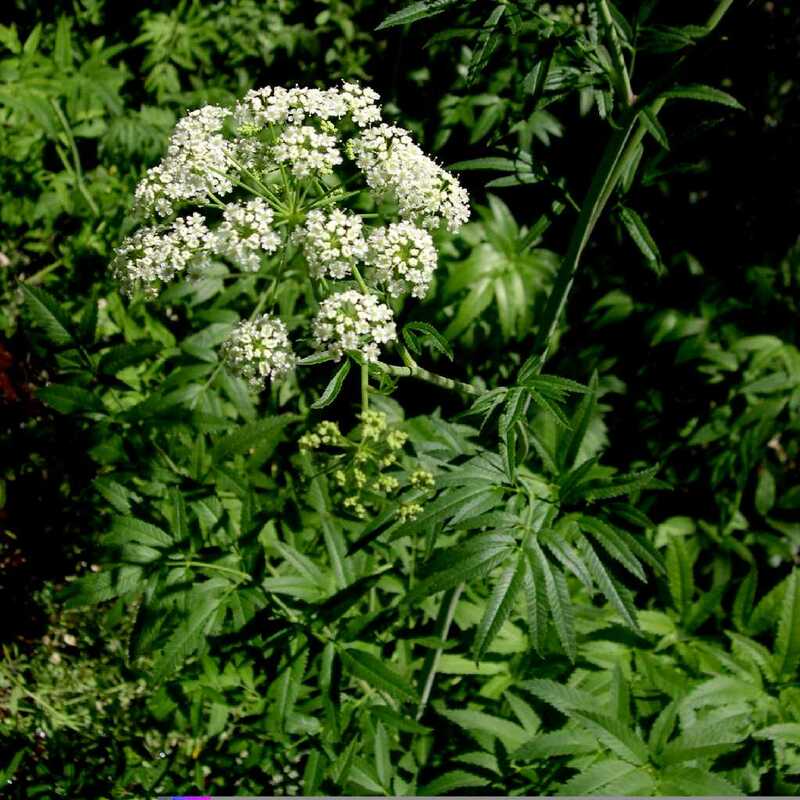 Cicuta maculata is a perennial herb to 2 m tall, sap yellowish, pungent (similar to parsnip). Roots clustered, tuberous, roots gradually consumed by growth, flowering and fruiting, but producing an overwintering, perenniating shoot before end of season; rootstock at base of stem, stout, hollow, with diaphrams of pith (Kingsbury 1964), often mottled with purple, upper stem hollow, much branched. 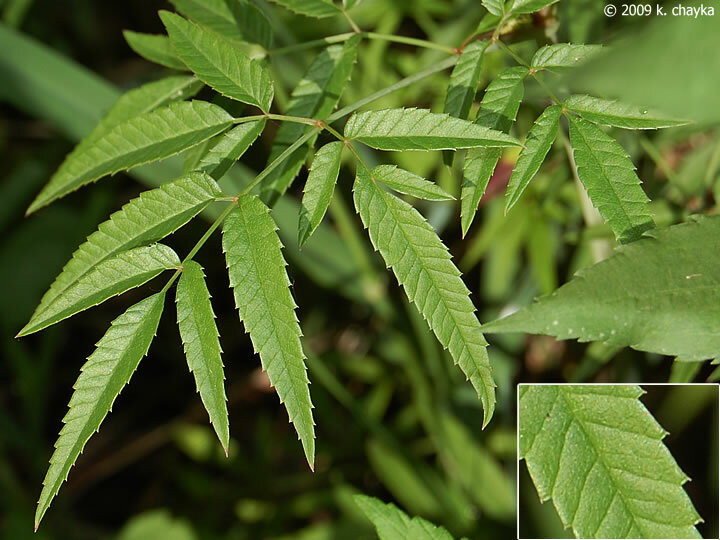 Cicuta maculata (water hemlock) leaf. © 2009 k. chayka. Minnesota Wildflowers. minnesotawildflowers.info (Accessed 1/2018). Leaves alternate, 2-3 times pinnately compound, leaflets in groups of 3, spring basal leaves to 1 m long, leaflets to 10 cm, narrow, toothed, small veins end in notches between marginal teeth, upper leaves often simple, main secondary veins ending in a sinus (notch between teeth) from which one fork often extends to the end of a tooth, base of leaf stalk sheathing stem. Cicuta maculata flowers. www.all-creatures.org (Accessed 1/2018). 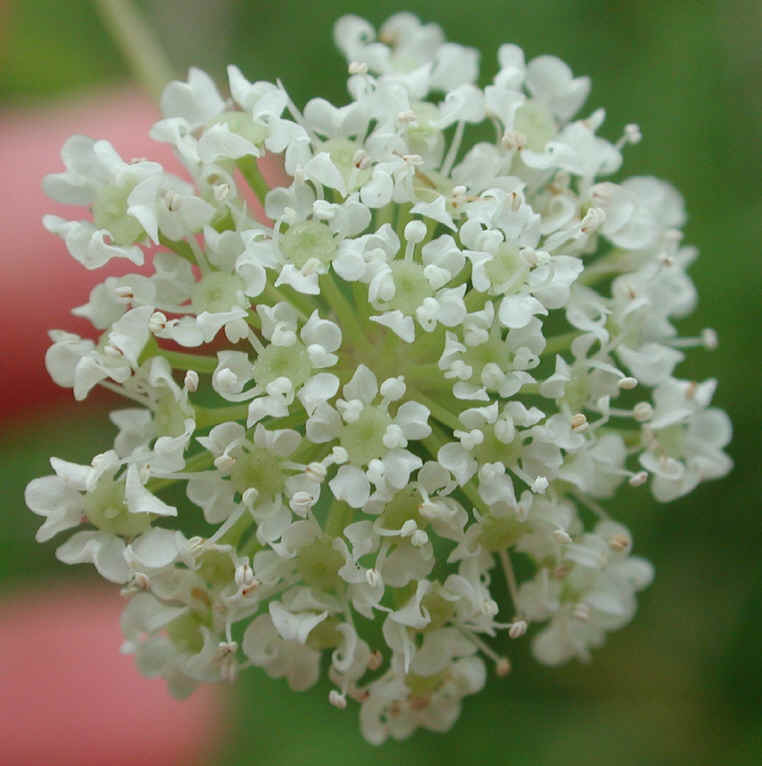 Flowers white, small, in umbrella-shaped clusters to 12 cm wide; inflorescence longer than leafy part of stem, pollinated by unspecialized insects; blooms June-July. Cicuta maculata fruit. Steve Hurst, hosted by the USDA-NRCS PLANTS Database. plants.usda.gov (Accessed 1/2018). 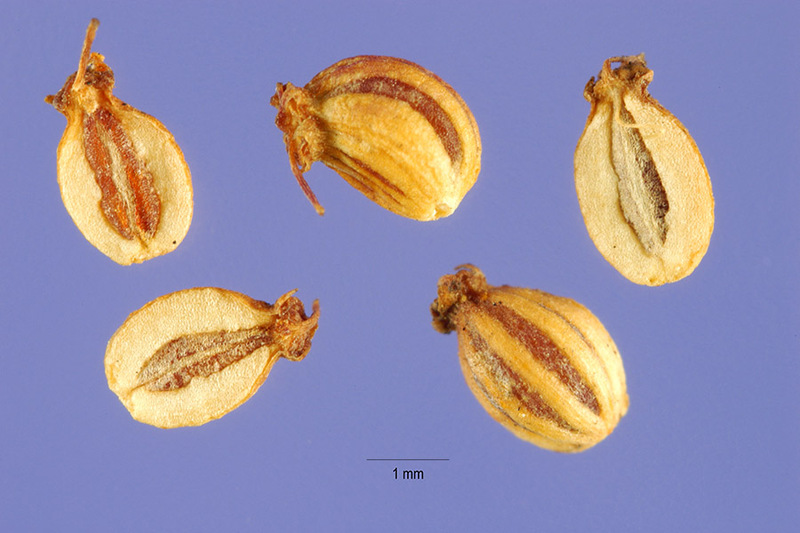 Fruit dry, to 0.4 cm, rounded, prominent pale brown ribs separated by darker stripes; fruits July through autumn. Seeds covered by a spongy coat that keeps them afloat for some time, dispersed by water. Seeds only germinate after immersion (Mulligan and Munro 1981). Habitat: Open swamps and marshes. Notes: Very poisonous, the toxin is a complex, unsaturated alcohol called cicutoxin, it acts on the central nervous system causing violent convulsions and can be lethal. Host plant of the rust fungi Puccinia cicutae and Uromyces lineolatus (Basidiomycotina: Hemibasidiomycetes), (Mulligan and Munro 1981). Apiaceae of open sites are eaten by larvae of the black swallowtail butterfly, Papilio polyxenes Papilionidae (Tallamy 2003; Pyle 1981).